As much as I love a good vintage dress, jeans and a tee or feminine blouse is my daily uniform. When it comes to the perfect pair of jeans, vintage Levi’s are probably my favorite. Because of the various styles, Levi’s fits every body type and the natural distressing on jeans are perfect and comfortable. 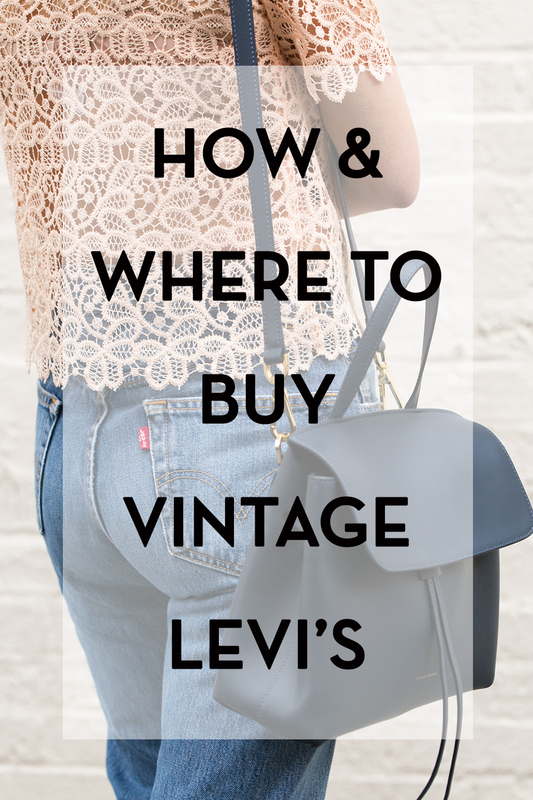 Last year, I shared my tips for finding the perfect pair of vintage Levi’s but you wanted more! 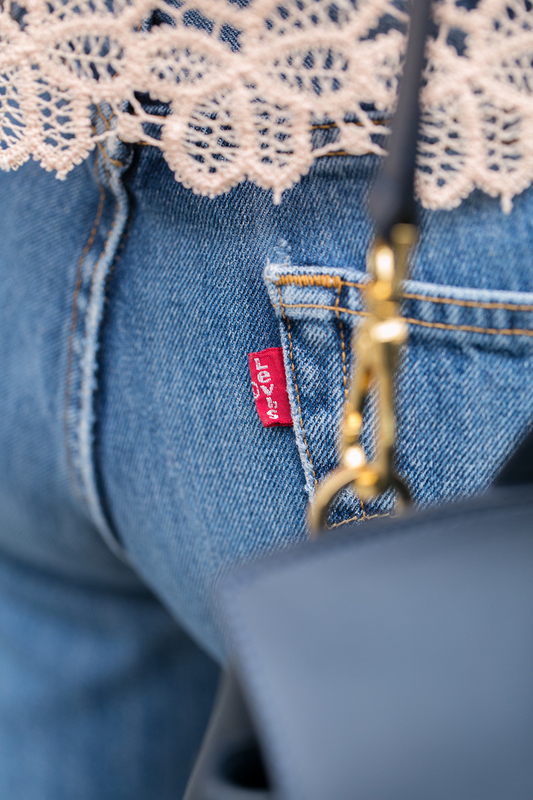 The questions I’m most often asked are, “where do I find the perfect pair?” and “how do I shop for vintage Levi’s?” Read on, my friends. 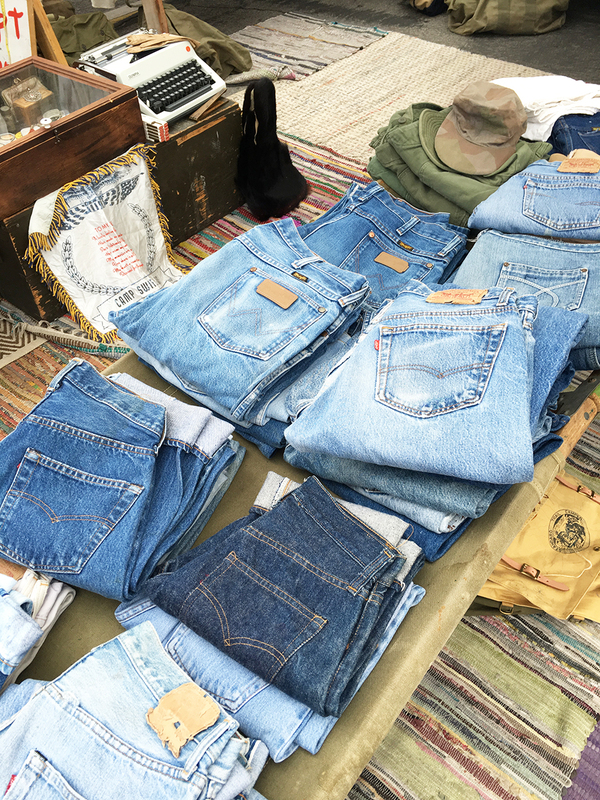 Hands down the best place to shop for vintage Levi’s is at the flea market. You’ll pay as little as $8 for a great pair of jeans, but you should know your sizing as you may not be able to try them on before you buy. A handy tip is to wrap the waist of the jeans around your neck. If it wraps around, then it should fit. It’s a random tip, but it hasn’t failed me yet! Etsy: My favorite sellers are Hunted Finds and Fairseason which specialize in vintage denim, but don’t charge an arm and a leg! 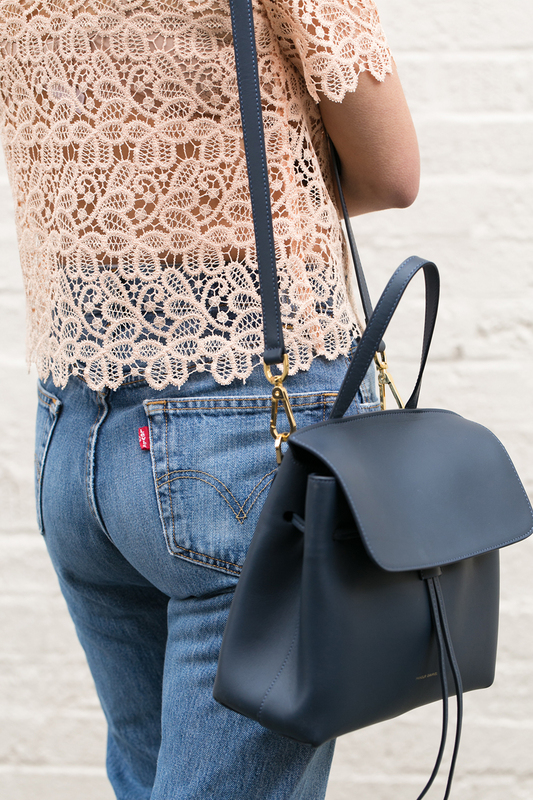 RE/DONE: This is where you’ll find repurposed vintage denim. The pieces are hand cut and sewn for a perfect, modern fit but they are pricier than other options. Denim Refinery: They boast an expertly curated selection of vintage denim, with a lot of great vintage 501s. Urban Outfitters: The “Urban Renewal” collection offers a good selection of vintage Levi’s that are sourced and updated. Old School tags: Authentic vintage Levi’s jeans are those manufactured before 1970. You can easily verify the true vintage of the jeans with this easy trick: find the red tab and check for a capital “E” in LEVi’s. Styles from the 80s and 90s are great too, so don’t limit yourself to the big “E”. Borrowed from the boys: Don’t ignore men’s jeans while on the hunt for your perfect vintage Levi’s. Most vintage Levi’s are men’s styles and sizing! Again, fit and wash are most important so venture beyond the women’s jeans and find something from the boys. Mom jean versus dad jeans: If you’re looking for super high-waist jeans then shop women’s jeans, but if you want loose and casual then shop men’s jeans. 501s and 505s offer a straight and relaxed fit and they are great for cutting into shorts and crops, or hemming and rocking a seriously awesome pair of boyfriend jeans. Note the 501s have a button fly, while the 505s have a zip fly. 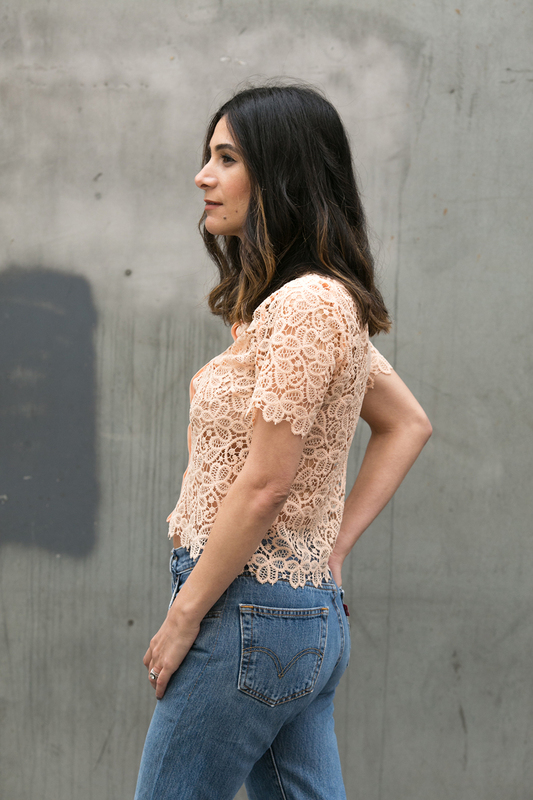 551s offer a looser and tapered fit for a serious mom jean. It’s perfect for the petite gal since it’s a vintage women’s jean and will fit a smaller frame better than the 501s. 701s are similar to the 551s, but run smaller and narrower! Sizing: Don’t get bogged down by vanity sizing and pay attention to the measured size of jeans. If you’re shopping at the flea, try them on. If you’re buying online, follow the measurements guide and make sure you can return. Vintage Levi’s runs much smaller than modern denim. Expect to size up 2-4 sizes when shopping vintage. Always asked for the measured waist size (as opposed to marked size) when you shop online. For reference, I’m a modern 26 and buy vintage 28 – 30. Alterations: I have found great long length Levi’s which I cut into shorts and crops (like pictured). The most important things are fit and wash. Find a pair that fits you well and has a great wash and you can transform them from tapered jeans to shorts or crops in less than 20 minutes. If the fit around the thighs is too baggy, take them to a good tailor and get them sewn in. Getting a baggier pair of jeans is better, as that gives your tailor more denim to work with and really give you that hugged around the thighs look. Check out this Guide to Vintage Levi’s I put together that goes into detail on different styles and sizing! What a great outfit, you have fantastic cameraman. Hi Mai! Thanks for stopping by. So vintage 512 are women’s jeans and they came in straight leg, bootleg and skinny (momish style jeans). They are designed to fit a woman’s curve as opposed to the more straight fit of the 501s. If you’re buying online, definitely confirm that it’s the skinny leg so you get the mom jean look. I’m the same size that you are in modern jeans and I’ve sized up to 28 and 29 in vintage 501 and 517. I always go off of the actual measurement (check waist, hip, and rise) to ensure a good fit. I hope this helps!